I use in my classes and my quilts. 1. Click on this link to download the Tutorial from Quilt Festival Open Studio. I am often asked what thread I use so I am going to post a series of mini tutorials on the tools and techniques I use most often. I like different threads for different purposes. For piecing blocks I prefer a 50 wt cotton Masterpiece by Superior thread or 50 wt Konfetti by Wonder Fil. I buy mine online or at big Quilt shows when the thread Co has a booth. Masterpiece is a 3 strand Egyptian cotton thread with very low lint. It is a great all purpose Quilt thread. I also use it for machine appliqué when I do a buttonhole or blanket stitch. I like to match my thread to my fabric, as closely as possible, and Masterpiece and Konfetti both come in a great array of colors. Yes, I do have most of their colors. Check out Superior’s thread of the month club on their website. If I am doing piecing with small pieces I always decrease the size of my thread (and the size of my needle). I really like Aurifil for this purpose or any 60 wt cotton thread. The bigger the number, the lighter weight the thread. I have been known to use a 100 wt poly thread named Invisafil by Wonderfil thread co for paper piecing really small stuff, and for machine appliqué when I don’t want the thread to show. It is so fine and strong that it really doesn’t show up on most fabrics. I have a neutral light and a neutral dark invisafil that I can use on most every color. No need to match thread. Can you use poly thread on cotton? YES. It will not harm the fibers as some old wives' tales suggest. Today’s threads are so much better than before, you should not have any worries about using poly thread. Many quilters use it exclusively. If I want the thread to shine and add texture and definition to my appliqué I will use a 50 wt silk or 40 wt poly embroidery thread. I love the way silk blends into the edge of the appliqué with a subtle sheen. In my opinion it is the best thread for machine appliqué. The problem is that it is expensive, and often does not come in the range of colors you need for a project. A full collection of silk thread would cost a bundle. I prefer the 50wt Tire silk by Superior. One last word on thread. 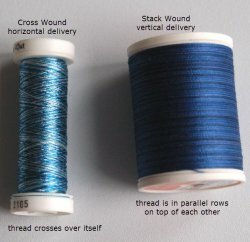 If your spool is cross wound like Aurifil, it should be positioned horizontally on your machine so the thread comes off the top of the spool without the spool spinning. If you have straight wound thread, like Masterpiece, it should be on a vertical spool pin so the thread comes off the side of the spool with the spool spinning. This is because of the twist of the strands in the thread. If your thread gets too twisted up the wrong way it will break and you will get skipped stitches.